How many times can I get heat exhaustion in one day? It was 110F or something like that today. All I know is that it was HOT and I wanted to stay home but I had important things to do which will make my life easier eventually. I made it to Home Depot by 10 which is early for me. They had to retrieve my toilet from the back so I went shopping for push-fit SharkBite connectors. 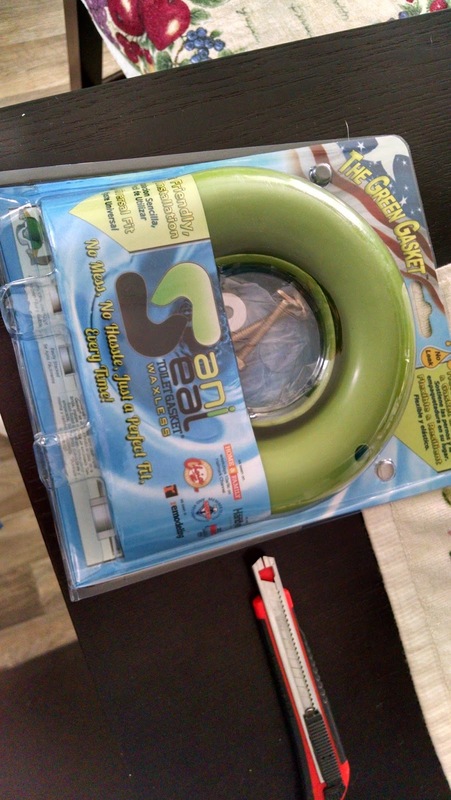 I was going to buy them last time but I got confused by the SharkBite brass barbs and compression rings and I thought that was what I was supposed to buy but, no. The copper rings are too hard for me to squeeze and it was either spend more money on tools or change to the more expensive push-fit connectors. I like them because they are simple and re-usable if/when I mess up. I spent $200 on fittings but I bought extras to avoid numerous trips to the store. When I am finished I can take the extra ones back. This is my new toilet after I took it out of the box because it was too heavy for me to carry in the box. 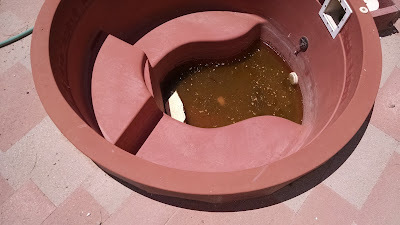 This is the jacuzzi turned in to a mosquito breeding ground from the recent rain. It is right next to where I was working on the plumbing so I had to stop and scoop water out until I got too hot and then I went inside and searched for the BT granules which is a natural way to kill mosquito larvae. 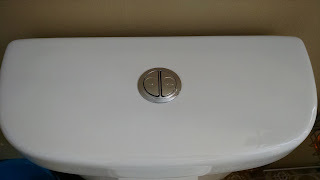 This is the fancy toilet ring that I bought but didn't need. I had heard terrible things about wax ring failure but I didn't have any problems, probably because it was so hot in the bathroom the wax was very gooey. This is another distraction. 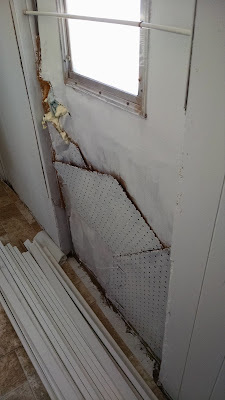 The hall door is still un-usable and I haven't covered or removed it yet. It bothers me every time I go by. 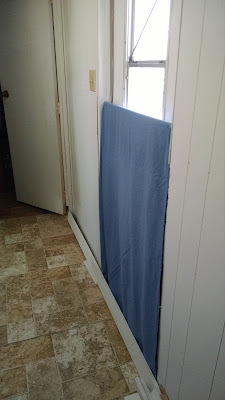 The little tension rod with a twin sheet covers up the hideousness nicely. Not fixed but covered up for now. 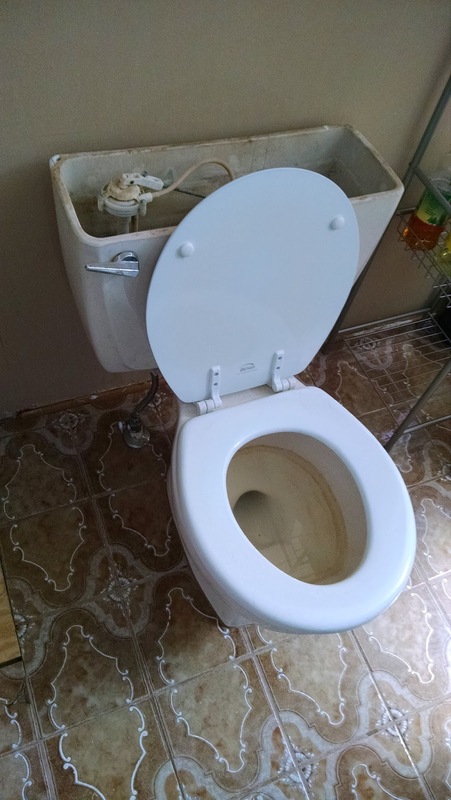 This is the old 4 gallon flusher. I will not miss hauling 4 gallons to it. The inside of the bowl was pretty gross too. The old wax ring was melty and very hard to remove. I had gloves on but I used some tools and they got sticky from wax. 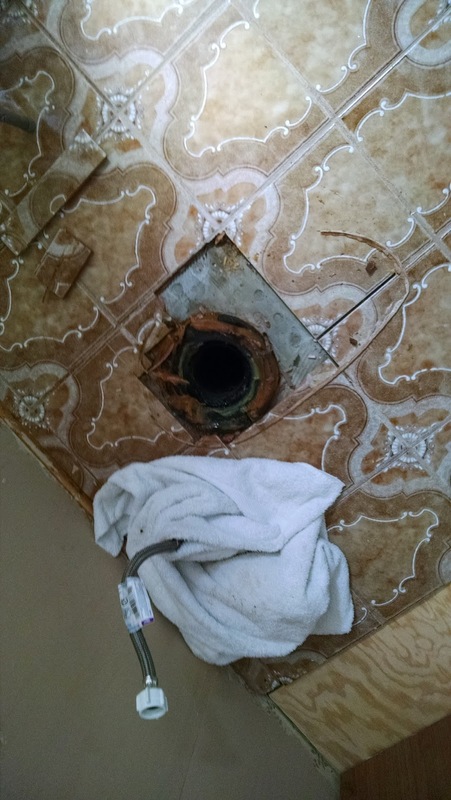 This was the worst part of the toilet replacement process. Ta-Da! The new low-flow toilet! I am happily surprised that I installed it successfully the first time. Look at those fancy buttons. The left one uses 1.1 gallons and the right one uses 1.6 gallons. The bowl does not fill with much water so it will probably get dirty easier. I hope my nephew will cooperate with my toilet paper in the trash can request. I think that will greatly reduce any chance of clogging. The big questions left is, "Is there water to the toilet?" Sadly, no. For one glorious moment, I had running water to both the sink and the toilet. 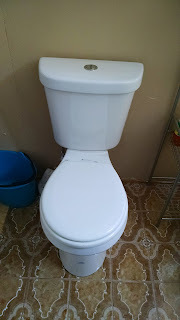 I actually considered putting off installing the new toilet since the water would automatically fill now but I am glad that I went ahead with it because the pump started acting up again. I was too exhausted, hot and starting to get a headache so I didn't start hooking up the little RV pump. It turns out that the reducer fitting that I bought today was the wrong size. I need to go down from a 1-1/4" pipe to 1/2". I made a list of a few other connectors that I will need. I'm not looking forward to another Saturday of plumbing especially since it will involve going under the mobile home but I sure will be happy with this stage of the project is complete. At least we will only have to carry 1 1/2 gallons to the toilet this week instead of 4 gallons . That is progress. You are doing so well anyways. Will the jacuzzi ever have a more conventional use? I hope you can enjoy a relaxing time in the Jacuzzi once you have finished all of this home remodeling work. I am sure we'd like to see pictures of a happier and more relaxed Daizy. 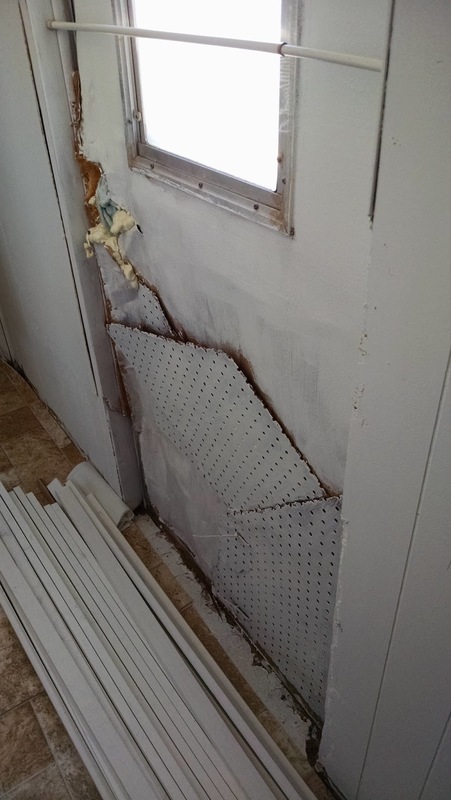 But before you do that, can you make a stop at my place to help me install some window shades to replace the blinds which have been falling apart over the years? 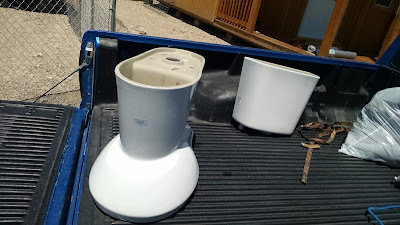 I bought the wrong brackets but my super will get the right ones for me and show me how to install the shades but it would be much more fun if you could help me out!